Whenever you feel like creating a tropical paradise look into your bedroom, the most important thing that you should include is the beach setting along with the warm ocean feel plus also the tropical smell of coconut oil that can add touch of paradise setting into the room. 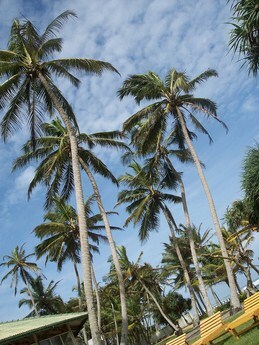 For example, you can create an environment of the Caribbean Sea along with swaying palm tree. Besides that, you can also make use of wicker bedroom furniture, floral prints and making sure that the room has lots of light so that you would be able to feel a tropical getaway just within your bedroom area. You can also get some ideas for creating tropical paradise décor for your bedroom simply by visiting your local home décor shops to look for items that you can apply into your bedroom, which relates to the Tropical paradise theme. First thing that you can do is to paint your walls with color that represent the Caribbean Sea. You should choose sea-foam green or a teal blue paint color for your bedroom walls. Both of these colors can also be used as two tone colors by painting one of it for the top half of the wall while the other one for the bottom part. You can make use a palm tree as border to separate both of the colors. Another option is to apply a tropical mural which include ocean and palm trees design onto the wall. You can also make use of a bed skirt designed with tropical blue colors that has imprinted palm trees to match your tropical paradise theme. In addition, you can even add solid cotton sheets onto the bed and then place a comforter and shams that matches the bed. After that, take additional pillows to mix with the shams within the greens of your palm trees and also your printed blue background. Next step is to create tropical lighting for your bedroom. Add some seashells at the bottom glass of lamps by using glue. You can even design your very own unique lampshades once you managed to wrap grass cloth onto the lamps or you can also print tropical fabric around your lampshades. Another method that you can apply is to add bamboo blades onto your ceiling fan. For those of you who have a sea shell nightlight, you can hang it on your wall. To make it even more natural, you can install a palm tree switch cover onto the wall. When you are dealing with lampshades, make sure that you always keep the shade away from the hot bulbs and also switch off the power of the lamps. If your budget permits, you could purchase furniture made of tropical woods such as a bed that come with a woven bamboo headboard or a bamboo canopy bed, a night table made of rattan with glass top cover or even a rattan chest drawers. In addition, you can also place a bamboo chest at the foot of your bed together with rattan chairs for you to relax. Next step is to use a few lush green plants inside the bedroom to create a tropical paradise feel when you are in the room. Look for a large elephant palm and find a suitable area in the corner of your bedroom to place the plant. You can also decorate the room with ferns and pathos by spreading them on your dresser or even hang them from your ceiling. In order to inject a more natural look, you can add small figurines of parrot or other birds onto your plant containers or palm trees. A rattan clock that you can hang on your bedroom wall. Use a few parrot bookends for holding your book collections on the shelf. Hang tropical-themed photo frames like palm trees, sea shells, flip flops or parrots on your walls. Finally, you can also place fake tiki torches at every corner of your bedroom as a nice decor. Apart from that, you must ensure that the room is provided with enough light so that the room will always look bright. You can even use bamboo shutters that can be drawn especially during the day that allows adequate sunlight to enter your bedroom. You can even use your creativity by collecting a group of sea shells and fill it into a bowl to be placed on your dresser. Make sure that you do not light up any candles around your grass skirts within your bed. You should always use white or pale blue for sheets, bedspreads and comforters, plus also adding mirrors to your bedroom so that you would be able to create various kind of lighting. If ever you decide to use aromatherapy candles, make sure it is place in a safe area and it must contain essential oils that come with various type of island scents like tropical or summer breeze. As for the flooring, you can use carpet with sand colored design; sand colored tile or linoleum so that you can create an authentic look for your bedroom.